Search results for left-wing identities on major search engines are replete with hateful and incendiary anti-liberal images, while searches for right-wing identities return relatively tame and non-divisive results. I show this by comparing the image search results for liberals, leftist, and leftists with conservatives, rightist, and rightists, respectively. From now on, these terms will be referred to as identity terms. In this experiment, I used these search engines: Google, Bing, Yahoo, and Aol Search. Screenshots of searches for left-wing identity terms will always be on the left, and screen grabs of searches for right-wing identities will always be on the right. Safe search was on in all of the screenshots. I did this to emphasize that even with safe search activated, inflammatory content is still present in search results for left-wing identity terms. The screenshots display the first four or five lines of results for any term. The amount of lines varies per search engine. Anti-liberal content is defined as images and memes that mock and/or attack left-wing political ideas, activism, and leaders. Good. We’re now ready to compare search results. Let’s begin with Google. Google was the first search engine I used in this experiment. It’s worth noting that the results for leftist are not as incendiary as the results for leftists, but it is noticeably more controversial when compared to results for rightist. This is the case for all search engines. I encourage readers to click and zoom in on the images below to view the disproportionate amount of hostile images on the left side than on the right side. Bing was a very special case in this experiment. Not only did Bing display a lot more anti-liberal images than anti-conservative pictures, the algorithm also made hateful search term suggestions — unlike Google. For example, when I searched for liberal, Bing suggested I search for stupid liberals, liberal idiots, and crying liberals. For leftists, I got crazy leftists and leftist snowflake meme. On the other hand, the top suggestions for conservatives included conservative women, liberal, and conservative memes. Yahoo is the third search engine I used in this experiment. It did not make any search term suggestions. Finally, the fourth and final search engine. Like Yahoo, Aol Search did not suggest any search terms. This experiment was inspired by the “three black teenagers” search controversy of 2016. 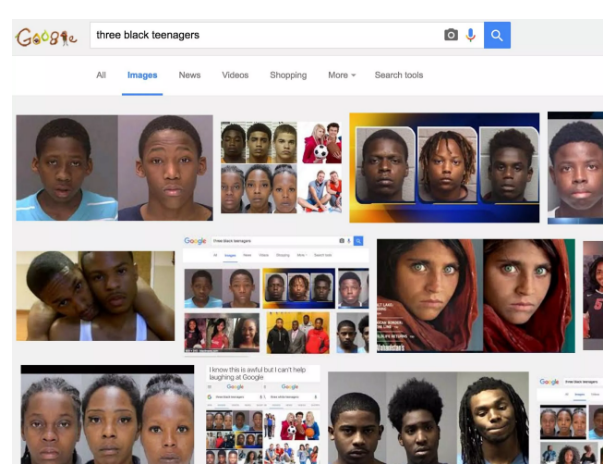 That scandal strongly suggested that Google’s search algorithm was racially biased when it returned images of police mugshots when a user searched for “three black teenagers.” But when one searched for “three white teenagers,” the algorithm returned pictures of young people smiling. After the story made national headlines, Google changed what appeared in the search results for the above terms. The experiment I conducted in the past few days strongly suggests that the image search algorithms for Google, Bing, Yahoo, and Aol Search are politically biased, especially in the results for liberals and conservatives. One can only imagine how much easier this makes it for non-liberals to download and spread images that were specifically designed to harass, not debate nor engage, the political left. This brings me to my second point: The experiment underlines the power and prevalence of memes in right-wing social movements. I say this with deep concern: It is apparent that rightists are hyper-reliant on memes to spread and support their ideas, memes that are oftentimes created and disseminated as propaganda. This is extremely dangerous as it prevents constructive dialogue to occur between people on both sides of the political spectrum. I encourage readers to call on the above search engine companies to take a closer look at how their algorithms spread and promote politically toxic images on their websites. I ask you to do this for the sake of our neighbors, no matter their political beliefs, for our countries, and for the generations to come.